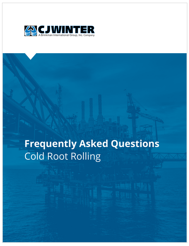 Questions about the cold root rolling process? There is no one better equipped to answer than CJWinter. Our Frequently Asked Questions guide answers all this and more — you may even find the answers to questions you didn’t even know you had! To access this informative guide, simply fill out the form to the right. For any immediate questions – don’t hesitate to call us at 1 800-288-7655.